The UAC restrictions on Windows 7 restricts every application to run under standard user privileges until an administrator authorizes an increase in elevation. In normal circumstances, WinSQL does not require elevated rights. However, opening the ODBC Manager on a machine is considered a privileged task. When you click the ODBC Mgr button in the connection window, WinSQL tries to spawn another process, the ODBC Manager, and waits for it to exit. 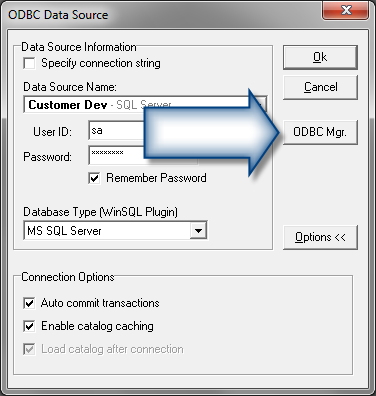 When the user exits ODBC manager, WinSQL refreshes its list of available ODBC Data Source names. On Windows 7, a process that does not require administration rights cannot spawn a process that require these rights. Therefore, the OS never opens the ODBC Manager. As a work-around, click Open ODBC Manager under the File menu. This method does not wait for the child process and therefore, the operating system displays the UAC prompt and lets the user see the ODBC Manager.